Originally published by USC News on January 7, 2019. Written by Leigh Hopper. Two groundbreaking discoveries by USC researchers could lead to medications and a vaccine to treat or prevent a hemorrhagic fever, transmitted by a new tick species, before it spreads across the United States. In a related discovery published in Nature Microbiology last month, researchers at USC and in Korea found that aged ferrets with the virus exhibit symptoms similar to those seen in older humans, while young ferrets show no clinical symptoms. An animal model through which to study the virus, a crucial tool in vaccine or drug discovery, has been elusive until now. The findings come at a time when health officials are increasingly concerned about the growing danger of tick-borne illnesses. In the United States, Lyme disease accounts for most cases, but other illnesses are on the rise. The total number of reported cases has more than doubled in the past 13 years, according to the Centers for Disease Control and Prevention. The new threat comes in the form of a bug new to North America — the Asian longhorned tick, Haemaphysalis longicornis. It’s a tiny, parasitic arachnid that’s a major livestock pest in East and Central Asia, where it thrives under temperate conditions. After a blood meal, females drop off their host to produce 2,000 eggs at a time, with or without the help of a male. It can transmit severe fever with thrombocytopenia syndrome (SFTS), an illness that causes nausea, diarrhea and muscle pain. The illness is often lethal, killing up to 30 percent of hospitalized patients. The virus depletes blood platelets as it replicates, which prevents clotting and leads to hemorrhage similar to Ebola virus infection. The disease has spread to Japan and Korea since it appeared in China. The SFTS virus has not been detected in the United States, but the Asian longhorned tick was found in nine states during the past two years: Arkansas, Connecticut, Maryland, New Jersey, New York, North Carolina, Pennsylvania, Virginia, and West Virginia. The CDC considers the presence of the Asian longhorned tick in the United States an “emerging disease threat” and is recommending ongoing surveillance efforts and testing for pathogens. A virus genetically similar to SFTS virus, Heartland virus, and causing similar human illness was also recently discovered in the United States. Globally, the SFTS disease has caused infection of thousands of people a year in China. 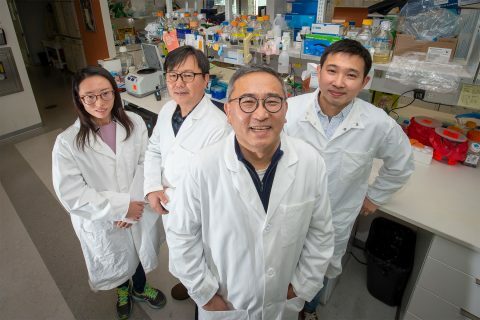 Jung and his colleagues found that the virus targets a gene called TPL2, which is involved in the body’s inflammatory response. In a healthy person, the body’s natural inflammatory response helps fight off an infection. With SFTS infection, the virus directs the TPL2 gene to switch off that protective inflammatory response at the site of the tick bite – creating a protected spot in which the virus can amass copies of itself and spread throughout the body. In animals, the researchers disabled TPL2 with an inhibitor; as a result, the body’s healthy immune function kept viral replication in check, resulting in a milder infection – and suggesting that the TPL2 gene’s signaling pathway presents a potential target for a therapy. In addition to Jung and Choi, authors of the Jan. 7 study are Ji-Seung Yoo, Sumanth Pudapakam, Suan-Sin Foo, Woo-Jin Shin and Sally Chen, all of USC; Su-Jin Park and Young-Ki Choi of Chungbuk National University in South Korea; Yinyan Sun and Wenhui Li of the National Institute of Biological Sciences in China; Philip Tsichlis of Tuft Medical School in Boston; Won-Ja Lee of the Korea Centers for Disease Control and Prevention; Jong-Soo Lee of Chungnam National University in South Korea; and Benjamin Brennan of the University of Glasgow in the United Kingdom. The work was supported by grants from the National Institutes of Health (CA200422, CA180779, DE023926, DE027888, DE028521, AI073099, AI116585, AI129496, AI140718, AI140705) the Hastings Foundation, the Fletcher Jones Foundation, the Wellcome Trust Senior Investigator Award 099220/Z/12/Z and a Wellcome Trust/Royal Society Henry Dale Fellow grant, the Korean National Research Foundation (MEST 2015020957), the National Science and Technology Major Project China (2013ZX09509102) and the Korea Health Industry Development Institute (HI15C2817).